You don't need money to have a good time in the windy city. If you love to explore on foot and you do you research, you'll find plenty of options for experiencing Chicago without spending a single dime. 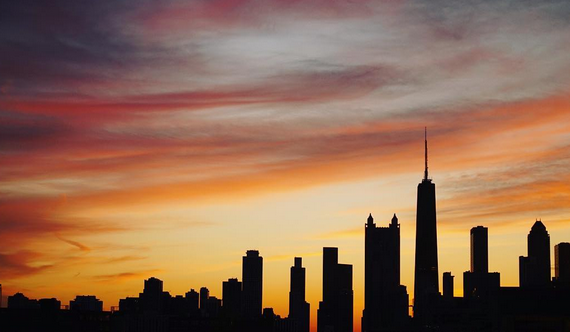 Here are ten fun things to do in Chicago for absolutely free! Purple headscarf-wearing, camera toting globetrotter on a mission to bring together humanity through meaningful travel experiences. Watching a beautiful sunrise is always worth waking up early for, and a great way to start a visit to a city with a stunning skyline. There is no shortage of great spots to view the sun's golden rays lighting up the world famous architecture of Chicago. If waking up early on vacation is not an option, catch a sunset instead and watch as the city's building stand in silhouettes in front of a blazing orange sky. Start your visit at the Chicago Cultural Centre, a spectacular neo-classical granite and limestone building. Situated in the heart of the downtown the centre is the go-to place for all the information you'll need to plan your stay. Make sure to take advantage of the free customized walking tours. When booked at least seven days in advance, a Chicago resident will design and lead a free customized tour based on areas of interest that you specify. Chicago's famed architecture makes it one of the most beautiful cities in the world. If a detailed itinerary is a not a necessity when you're on vacation, then ditch those tourism brochures and just take a walk around the city. Chicago proudly boasts some of the best architecture on the continent. If you're not already downtown, hop on any of the eight train lines and head to the loop. Here you'll come across astounding work of world-renowned architects including the famous Chicago theatre, the Michigan avenue bridge, the magnificent Wrigley building, Marshal Field's famous clock and the rustic Gothic inspired Tribune Tower. Need a bit of guidance? Flip open the pamphlets you picked up at the Chicago Cultural Centre and follow one of the many self-guided walking tour routes to discover downtown Chicago at your own pace. With over 700 works of public art sprinkled across the city, anyone could spend days exploring and still not see it all. Some of the famous public art installations can be seen at various public parks including the Buckingham Fountain at Grant Park, the interactive structures at the Children's Garden, some historic pieces at Hyde Park, and animal themed sculptures at the Lincoln Park Zoo. The most famous of them all is a 50-foot-tall sculpture created by none other than the legendary Pablo Picasso. If you need a little break from the hustle and bustle of the city, head over to Millennium Park. One of the most popular destinations in the city, the park is home to an array of public art, architecture and greenery. Take pictures in front of Cloud Gate, also known as "the bean" because it resembles a shiny silver kidney bean. Splash around in the Crown Fountain, a giant video screen that displays images of Chicagoans and spews water. Enjoy a show (or just your lunch) at the Jay Pritzker Pavilion, designed by world renowned post-modern architect, Frank Gehry. Or take a stroll through the Lurie Gardens where you can admire the flora and relax by a man-made stream. When you're ready to get back into action, immerse yourself in one of the many street festivals that happen throughout the city all year long. Indulge in delicious food at the Taste of Chicago festival, enjoy rhythm and the blues at the Jazz Festival or test your skill at a new sport at the Chicago Sports Fest. Take a walking tour through Chicago's historic Old Town neighbourhood and admire the city's Victorian-era buildings. Marvel at the unique architecture of West Burton place, built using materials from nearby demolished building. Visit St. Michael's Church, which features stained glass windows that were imported from Munich and one of only seven churches that survived the Great Chicago Fire. Or spend an afternoon at the Chicago History museum where admission is free every Monday. When you're tired of walking around, head down to the Oak Street Beach. Just one of 26 beaches in Chicago, the Oak Street Beach is popular due to its close proximity to the city centre and its dramatic views of Chicago downtown. On any given day the beach is a popular place to skate, cycle, play volleyball or just sunbathe. If you're a fan of art and culture, be sure to visit a museum in Chicago. On Tuesdays both the Loyola University Museum of Art (LUMA) and the Museum of contemporary Art swing open their doors to the public for free visits. Take a spiritual journey as you experience art inspired by major world faiths at LUMA. Or take a step into the 20th century as you admire at the unique creations by modern and post-modern artist. If you're in the city on Thursday, take advantage of the free admission at the Art Institute of Chicago where the collection ranges from pieces by modern photographers to ancient artefacts to work by local artists. Said to be the most popular tourist attraction in the state of Illinois, the Navy Pier is a place where people of all ages gather to have fun. Discover why Chicago is known as the windy city as you take in the breezy waterfront. Admire the unique creations at the Smith Museum of Stained Glass Windows and watch the mystical magic fountains at the Crystal Gardens. If you wish, for just a few dollars you can take a sky high ride on the gigantic Ferris Wheel. Or you can just sit back and relax on the docks and watch the sun dip into the horizon over Lake Michigan and the Chicago skyline.